Longhorn Council is already preparing for the 2017 Friends of Scouting Campaign (FOS). We are making a few minor adjustments in how the campaign is run. Each unit will be asked to provide a point of contact for the campaign referred to as a Unit Champion. 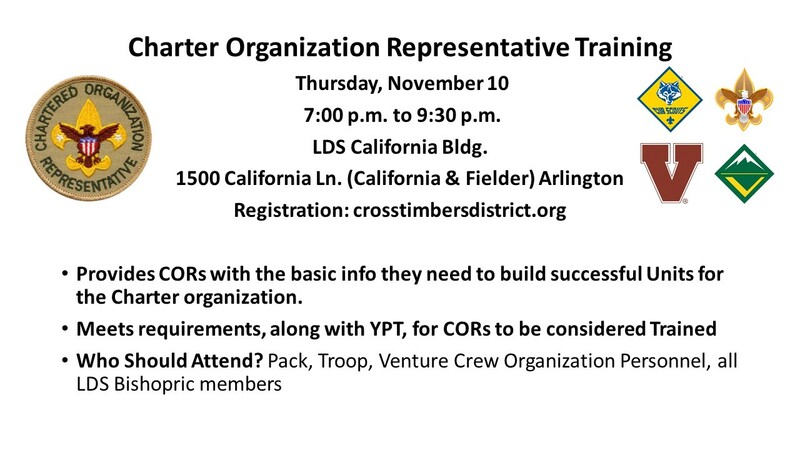 To facilitate this, the district will provide training, if needed, at the January Roundtable. Units will turn in FOS pledges at the March Roundtable. The goal is to complete the campaign and meet our goal in one month (February). LDS units will conduct their campaign on the 5th Sunday. If your unit would like to begin their campaign early, please let Gary Johnson know so that we can get you your materials. Each Unit should have received their goal for the 2017 campaign. Free Rank Advancement for units achieving their goal. 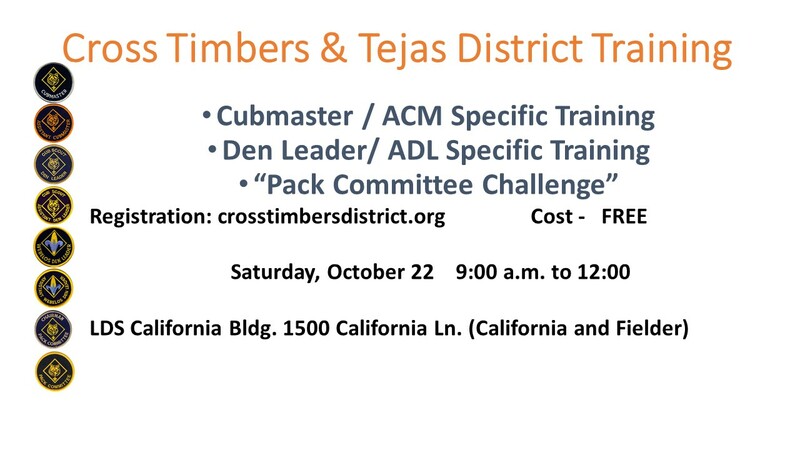 Packs may choose weekend camping discount instead of advancements and Venture Crews will receive a $200 certificate. All Webelos and their families are invited to "visit a Boy Scout Troop" next Monday Night September 26 at the 380 Open House 7:00 to 9:00 PM, it will be a lot of fun. Please see attached flyer with information and a Map to 380 Scout Hut, 1001 N. Davis - look for 380 trailers. 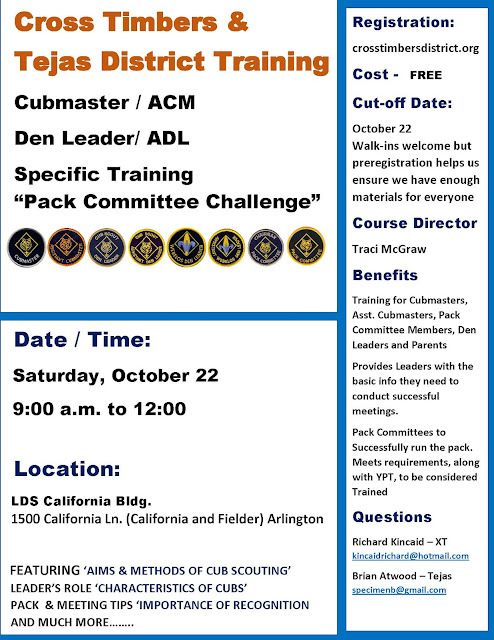 Webelos, this is your chance to complete the requirement visit a Boy Scout meeting … and have FUN! We look forward to visiting with you and sharing about all of the opportunities that Boy Scouting and Troop 380 has to offer your Webelos as they bridge into Boy Scouts. 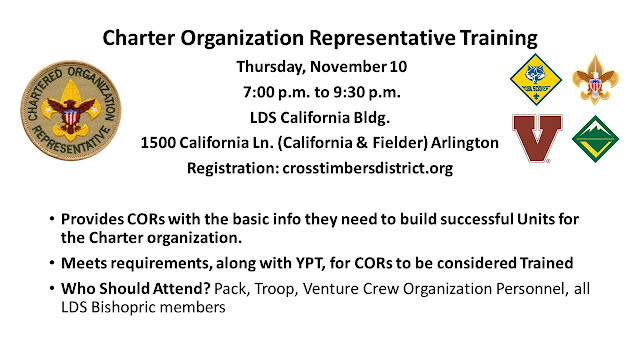 Ask about Trail to First Class and Trail to Eagle programs that helps Scouts reach their potential and their Goals. If Eagle Scout is your goal, remember Troop 380 has had 51 Eagle Scouts in last ten years. 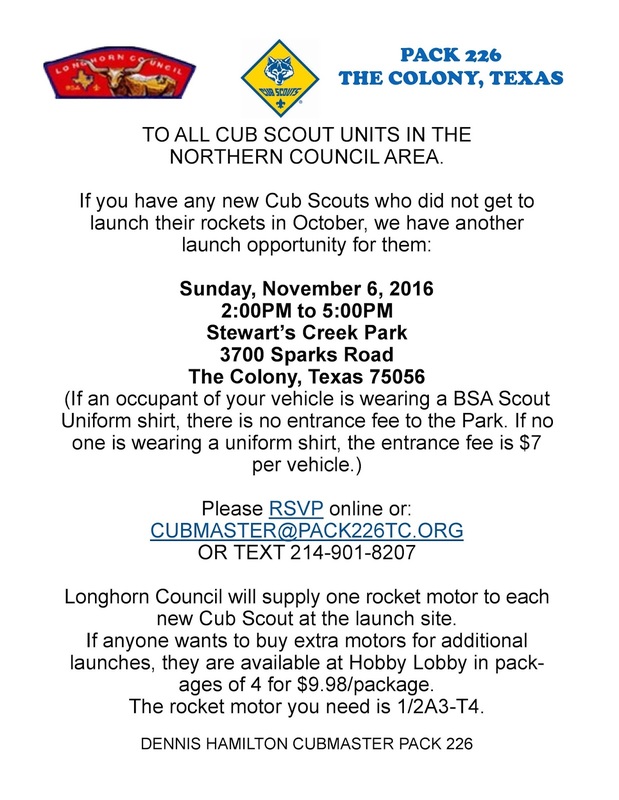 Please email leader@troop380.com or call 817-313-2001 if you have any questions. while experiencing outdoor adventures to last a lifetime! 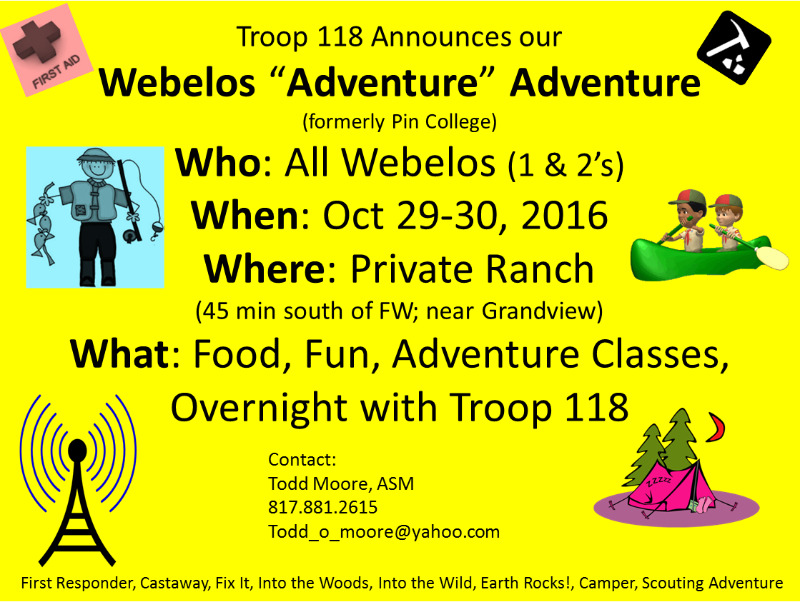 This is a friendly reminder about the upcoming Webelos Adventure Classes. Registration closes on Sunday, Oct 23. Don't miss the fun and excitement of this year's Council Camporee, which will be held NOVEMBER 11-13 at Texas Motor Speedway. This special event looks to be the largest en-masse camp-out in the history of the Longhorn Council. Our program will be jam-packed with challenging activities, super shows, and awesome; so register NOW to enjoy this most excellent adventure. The centerpiece of the Boy Scout, Varsity, Venturing, and Exploring Program is the huge annual Highland Games competition, with awards at the Camporee Show, and huge Camporee Midway of Displays and demos with Living History. The Cub Scout Program is a massive Cub Scout FUN Day and the huge Camporee Midway of displays and demos and Living History! Tiger Cubs and Cub Scouts can camp in the Cub Scout area. 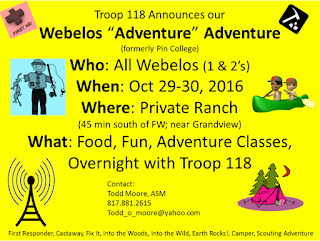 Webelos may camp with their Pack or with a Boy Scout troop. The BEST CAMPOREE EVER coming soon! <="">Don't forget to mark your calendars! November 11-13, 2016, Texas Motor Speedway is hosting a Camporee to remember. The Camporee Committee is building a huge selection of events to bring Scouts a show bigger than any before! The midway will be even larger, with more military units, government agencies, organizations, outdoor skills and equipment vendors. Also back from last year! The Highland Games! 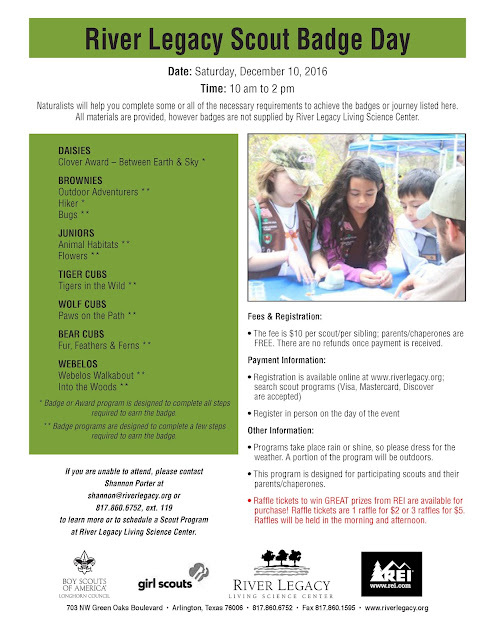 As well as, many more hands-on learning events for Cub Scouts! Want to discover how to change a cup into a ball? How to program a robot to finish a maze? How to make a working radio? How to make music with fruits and vegetables? These are just a few STEM Labs that are available at the Longhorn Activity Center. The programs are created by our STEM Committee in such a way that the kids don't know they are learning, it is too much fun! Fall Classes include Basic Robotics, Intermediate Robotics, Programming and STEM Labs. 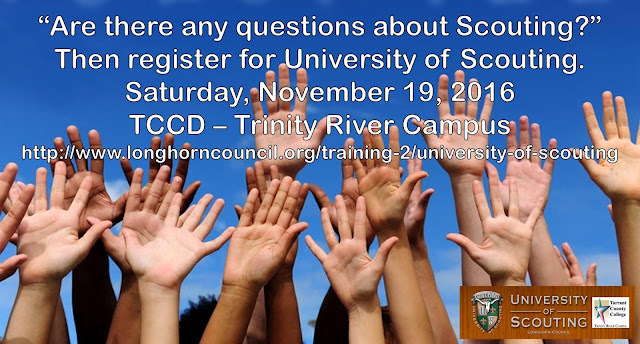 Space is limited, so sign up before it is too late! A recent study done by Byron R. Johnson, a distinguished profesor of the social sciences at Baylor University, reveals just how Scouts stack up to their peers. In his study he found that after only two years of being involved in Scouting, boys had improved measures of obedience, helpfulness, cheerfulness, kindness, trustworthiness and hopefulness. This may seem obvious to adults and parents who work side by side with these boys everyday, but for these young scouts to admit it themselves is a feat in itself. Not only that, but Johnson also found that Scouts have stronger planning skills, more group membership, and more personal networks that boys who were not in scouts. In this time of political discussions seeming to take over, we should not overlook the good news that instilling character in our American youth remains an achievable goal. 2017 National Jamboree: You are invited! Join us for an intense whitewater, caving, and battlefield adventure tour and the National Jamboree! Sign up now! Click here to watch a quick video and to find more information. Check out our Facebook page to find pictures and news from all the events happening in Longhorn council. Executive Board Officer, Kenn Wardle announced a newly designed Friends of Scouting approach to the District Chairmen and District Finance Chairs at the September committee meetings. The FOS campaign is one-quarter of the total revenue the Longhorn Council relies on to provide the range of Service and operations of the Council. It is a critical component of funding the Longhorn Council. This campaign is structured in two parts; one, is to make an outreach to the alumni and civic leaders, and that results in 60% of the total campaign; second strategy, is to invite family members to help support the services and year round operations and maintenance of the camps with their gifts this results in the other 40% of this campaign total. The Longhorn Council will conduct the Family Friends of Scouting Campaign for one month during the February scout anniversary month. The units that historically and successfully have conducted their campaigns earleir in the year, in November and December, certainly may continue to do so. The LDS church, likewise will be slightly different due to the nature of their program. For all other units we ask them to work diligently with the District volunteer leadership to follow the campaign guidelines and implement the One Month Campaign in February. New this year will be the use of more modern technology. A turn-key website will be developed for each unit that desires to execute their campaign through an electronic direct solicitation. This unit is still able to request an external presenter should they prefer . Look for further information during the fall and rechartering process. Stay up to date with all the most recent news and articles regarding scouting! Follow the link and check them out! Like us on Facebook for daily updates about events in the Council and fun and interactive posts! Are you proud of your scouts? Are you taking pictures of them having fun at camp? Want to share those pictures with all your scouting friends? Why not send them to us on Facebook and see your scouts on our page! High Adventure and Summer Camp Jobs Available! Know any high school or college students who need an awesome experience and a job? Click the link to find out more about staff interview dates, the application process, and an exciting array of openings this summer! In case you weren't excited enough about Camporee! Here are some shirts that will be available when we sign up! Distribution of this communication is directed to members of the Longhorn Council. To prevent mailbox filters from deleting mailings from Longhorn Council BSA, add lhcinfo@longhorn.org to your address book. Unsubscribe from all mailings from BSA - Longhorn Council. On behalf of Debbie Kerrigan, (Cub area coordinator for Camporee), could you please send this link http://signup.com/go/tE5rXn out to your districts? We have set this up so anyone interested in volunteering to supervise the cub area can add their name. We would very much appreciate your help!!! River Legacy After park in the Dark, needs additional Volunteers this weekend. This is also a great place to take the kids this weekend! !